In January 1995 Matthias Huber Engineering was founded and would later be transformed into the mhe GmbH & Co.KG in 2001. Development and manufacturing of electronics – from inception to serial production – for over 20 years we have been creating customized electronic components together with our customers. The results are innovative and top-quality products precisely tailored to our customers’ specifications and needs. Extensive experience in numerous branches and fields of industry, a high degree of professional competence in our engineers and the flexibility and dedication of our entire team guarantee top-quality products of highest standards which we strive to develop and produce at fair prices. Your success is our greatest achievement! 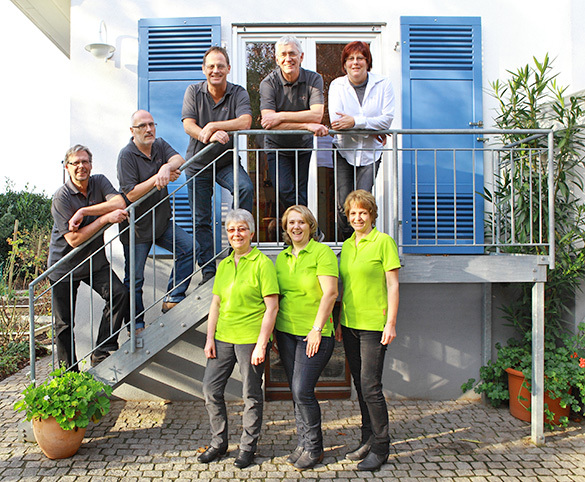 partner – owner of mhe GmbH (upstairs middle) with employees. In a progressively hectic business world continuity is an important trait for success. Our long-standing members of staff reflect this continuity in our personnel policies and make it one of our company’s greatest assets. Fairness and approachability are our core values and let us establish a friendly work environment which furthers both our productivity and creative output. Shared leisure activities outside office hours including all members of staff as well as their families also serve to strengthen our team’s professional cohesion and sense of belonging. We see this as an integral part of our ability to excel at our work and keep with the ever-increasing challenges and demands it confronts us with. Openness and fairness also govern the relationship with our customers. This helps us develop products that meet the highest standards and are bound for market success. We believe mutual trust inspires finding new ideas and innovative solutions.